Tree species exceeding 70m in height are rare globally. Giant gymnosperms are concentrated near the Pacific coast of the USA, but the tallest angiosperms are eucalypts in eastern Australia. In eucalypts, probable drivers of gigantism are intense intra-specific competition following severe fires, and inter-specific competition amongst adult trees. Giant eucalypts co-exist with rain forest trees in eastern Australia, but occur where rain forest is now extinct in SW Western Australia. Given ideal growth conditions, the local abundance of giant eucalypts is controlled by interactions between fire activity and landscape setting. Giant eucalypts have features that increase fire risk (eg. oil-rich foliage and open crowns, etc.) relative to other rain forest trees but debate remains whether these features are adaptations or exaptations. 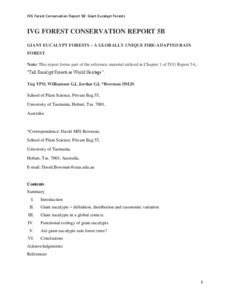 We argue that because giant eucalypts occur in rain forest climates and share traits with rain forest pioneers they should be regarded as long-lived rain forest pioneers, albeit with a particular dependence on fire for regeneration. The resulting syndrome of a fire-dependent forest above a fire-intolerant forest is only known in the associations between eucalypts and Australian rain forest. These unique ecosystems are of high conservation value, in light of substantial clearing and logging over the last 150 years.